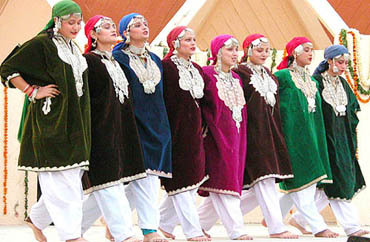 The Bharti group today applied for six new licences under the unified regime, for circles of Jammu and Kashmir, Uttar Pradesh (East), Rajasthan, West Bengal, Bihar and Orissa. Amidst all noise on outsourcing, British Trade Secretary Patricia Hewitt has backed the exodus of jobs from Britain to India saying half of the world’s poor live in India and the country will benefit from economic growth as jobs moved there. The Godrej group has acquired a US-based call centre company, Upstream LLC, in an all cash deal. The deal was routed through Lawkim Upstream Contact Management, a wholly owned subsidiary of Lawkim Ltd, a Godrej company since 1977. Finance Minister Jaswant Singh today approved 23 foreign direct investment (FDI) proposals involving Rs 40.76 crore, including that of US-based Pitney Bowes, to set up a wholly-owned subsidiary in India. 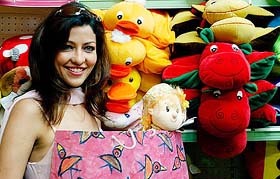 Former Mrs World and Bollywood star Aditi Gowitrikar displays items prepared by under-privileged children at a shopping centre in Mumbai on Tuesday. Truck owners will no more have to fear about the loss of cash or cheating by their drivers as they can now keep a tab on the movement of their trucks through a web-based pre-paid card offered by HPCL. 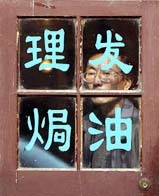 A barber waits for customers behind Chinese characters, advertising haircut and perm services, in Shanghai on Monday. Traditional shops are adapting to the times by offering new services in order to compete with modern and more fashionable hair salons that are sprouting up in China. Air-India (A-I) today opened its first office in Shanghai, ahead of the inaugural flight on December 11. Consul General of India in Shanghai Sujan Chinoy, who was the chief guest, commended the efforts of both Air-India and the Chinese authorities leading to the opening of the first Air-India office in China. Apple Computers today unveiled the latest version of its operating system — the Unix-based Mac OS X ‘Panther’ for server and desktop. With this, the company will virtually have an all-India footprint in the telecom sector except for North-East, and becomes the first private telecom company to apply for licence in Jammu and Kashmir. The Bharti group said it would offer GSM-based cellular mobile services in all these circles. According to officials, Bharti Tele-Ventures, the service arm of the Bharti group, has sought Letter of Intent (LoI) from the DoT to start services in these circles. It has expressed desire to offer cellular mobile services in the new circles at 900 MHz and where it was not available, it would offer services at 1800 MHz. According to sources, the company would shell out between Rs 60 crore and Rs 100 crore for all circles combined, depending upon the position of the fourth cellular licensee. Escotel, the fourth cellular licensee in Rajasthan had paid about Rs 34 crore but has not yet started the services, sources said adding that it would depend on DoT whether the fees paid by Escotel would be considered as the benchmark for the new unified licence. Besides Bharti, the Tatas have also applied for seven new circles, but DoT has not issued LoIs as the government was waiting for the TRAI guidelines with regard to issuance of new licences under the unified regime. The Bharti group said it was eligible for offering basic telecom services under its cellular licence, but emphasised its focus would continue to be GSM-based cellular mobile services. Her comments infuriated union and business leaders calling them “devastating” and accused her of giving the green light to jobs shift while tens of thousands of workers have been sacked in the UK. While addressing the Confederation of British Industry’s annual conference yesterday, Ms Hewitt hit out at calls for tough policies to protect home industries such as call centres, textiles and IT operations from the threat of India. “I also know there is no future for Britain in low-cost, low-margin production, certainly not trying to make cheap, white cotton T-shirts. Our response is not to put up tariff barriers. What we have to do is help companies into areas of the economy where we can compete. The Godrej group has acquired a US-based call centre company, Upstream LLC, in an all cash deal. The deal was routed through Lawkim Upstream Contact Management, a wholly owned subsidiary of Lawkim Ltd, a Godrej company since 1977. With this acquisition Godrej becomes the first Indian company to acquire and operate a major call centre in the US market, a statement by Godrej claimed. The company did not reveal the size of the deal. Lawkim has set a target of being a $ 100 million BPO company over the next three to five years. Finance Minister Jaswant Singh today approved 23 foreign direct investment (FDI) proposals involving Rs 40.76 crore, including that of US-based Pitney Bowes, to set up a wholly-owned subsidiary in India. The proposals cleared by the Foreign Investment Promotion Board mostly pertain to food processing, engineering, wholesale trading and IT segments. HPCL and ICICI Bank have entered an agreement to enable the truck drivers to get truck tanks filled from any of the company's outlets by using pre-paid cards— Drive Track Card. These cards will be launched by the end of this month in the country. A senior official of HPCL said here today that under the scheme, the truck owners would have to enroll themselves with a company outlet by paying Rs 100 for up to five vehicles. For the next vehicles, they would have to pay Rs 50 per vehicle extra. After registering with the outlet, the truck operators would be given the card to enable them to deposit money with ICICI Bank, that could be used by their drivers at any of the company outlet for getting their truck tanks filled. The daily limit for the truck drivers would be Rs 25,000. The networking between HPCL and ICICI Bank will update the data every four hours to offer information about the movement of trucks and transaction. Through Internet, the truck operators would be able to know at what time and at which station and how much diesel had been filled by their drivers. The movement he uses the card, the information would be flashed through the Internet to his owner. Enquiries with the bank revealed that it would revolutionise the operation of trucks. At present, there are over 30 lakh trucks across the country and about 1lakh trucks in Punjab alone. A senior official, dealing with the scheme, said,"Any truck operator can get the form from any company outlet. They would have to keep a minimum balance of Rs 1 lakh in the account to avail themselves of the scheme. "During the price revision, he said,"the dealers will have to upload the data before starting the operation of the card." Air-India (A-I) today opened its first office in Shanghai, ahead of the inaugural flight on December 11. Consul General of India in Shanghai Sujan Chinoy, who was the chief guest, commended the efforts of both Air-India and the Chinese authorities leading to the opening of the first Air-India office in China. The new operating system has over 150 features, including a new “Finder”, that provides one click access to a user’s favourite files and folders; Expose, to see all open windows at once; and iChat AV, a complete desktop video conferencing solution for business, education and consumers. Panther Server includes a Server Admin tool that makes it easy for administrators to set up and manage the open source software built in to Mac OS X. Apart from that it has open Directory 2 for hosting scalable LADP directory and Kerberos authentication services, Samba 3 for providing login and home directory support for Windows clients and the JBoss application server for running powerful J2EE applications. NEW DELHI: Honda City and Honda Accord have bagged the top position in C and D segments in the total customer survey (TCS) conducted by NFO Automotive recently. MUMBAI: ICICI Lombard General Insurance has introduced a unique overseas travel cover for senior citizens aged between 71 and 85 years under its Globetrotter Overseas Travel Insurance umbrella, a press note issued here said. NEW DELHI: Global storage solutions provider Hitachi Data Systems (HDS) today announced it would set up a fully-owned subsidiary in India in the next four months and said it expected revenues from the country to almost treble to $ 40 million by 2006. India country manager PP Subramanian told reporters here that the parent company would be investing close to half a million dollars to set up the new subsidiary. Currently, it operates in the country through a liaison office. MUMBAI: Reliance IndiaMobile has joined hands with leading Bollywood producers Yash Johar and Karan Johar for promotion of their latest movie “Kal Ho Naa Ho” starring Shah Rukh Khan, Preity Zinta , Saif Ali Khan and Jaya Bachchan, according to a company press note. HOUSTON: A supercomputer put together from 1,100 off-the-shelf Apple Macs at the Blacksburg school in one month at the cost of $ 5.2 million is now officially ranked number three in the world and the fastest university supercomputer.